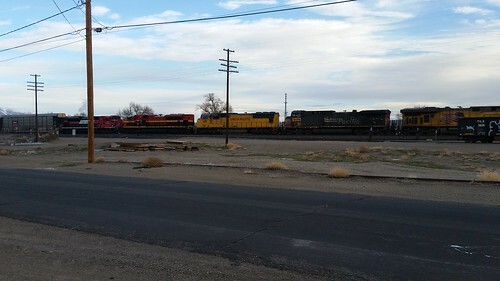 This morning, I heard the radio scanner crackle to life with a Union Pacific signal maintainer who had been called in to investigate why the signals on the main line at Fernley had gone to red with no trains in the circuit. (The signals are normally dark when there are no trains in the area.) He reported the bad news: a broken rail just west of where our house looks out over the railroad. The signal maintainer's pickup ("hi-railing" down the track) met up with a track repair crew that moved down the line to repair the break. 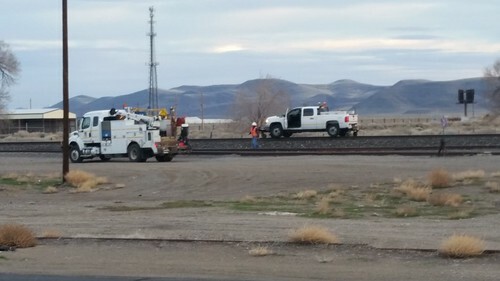 This didn't shut down the line, but it slowed things down, because Fernley siding is much slower than the main, as trains must slow to take the switches at each end. One of the trains that slowly moved through the area was this train with five locomotives sporting five different paint schemes: two different Union Pacific variations, an ex-Southern Pacific unit with a "patch job" (Union Pacific locomotive number painted in UP colors over the SP unit number), a Kansas City Southern, and to top it off, a Ferromex unit. Why these last two have been wandering around the UP, I do not know. I hunkered down on Day Jobbe until about noon today (after starting at 5:30 AM as usual, and also considering that I've been working longer hours earlier in the week). Lisa and I then packed up the minivan and headed to Tonopah.